The Waisman Center provides comprehensive clinical services and support to individuals with disabilities and their families through 11 interdisciplinary specialty clinics that operate in collaboration with UW Health and several UW-Madison academic departments. Professionals from many disciplines work together in the Waisman Center Clinics combining knowledge in the following areas: audiology, biochemical and clinical genetics, nursing, nutrition, occupational therapy, orthopedics, pediatrics, pediatric neurology, pediatric rehabilitation, physical therapy, psychology, social work, and speech and language. 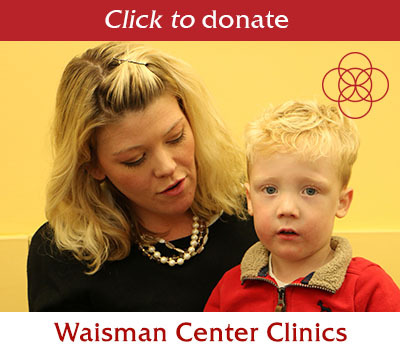 Your gift to the Waisman Center Clinics helps children, and their families, with conditions such as autism, cerebral palsy, Down syndrome, fragile X syndrome, PKU, and other developmental disabilities. We provide this specialized care with expertise and compassion.